Availability: Back ordered. 6 Week lead time. This is the newest addition to our lineup of 4K Security Cameras that offer the best possible video recording resolution in Ultra HD. It is a 12MP Security Camera that uses the latest Progressive Scan Image Sensor to produce 12MP video at up to 15fps, or 4K Ultra HD video (3840x2160 pixels) at up to 30fps, which is Real Time 4K. Please note that 4K video is synonymous with 8MP. 4K security footage offers the ability to digitally zoom in on recorded video with the highest amount of digital zoom possible before pixelation occurs. 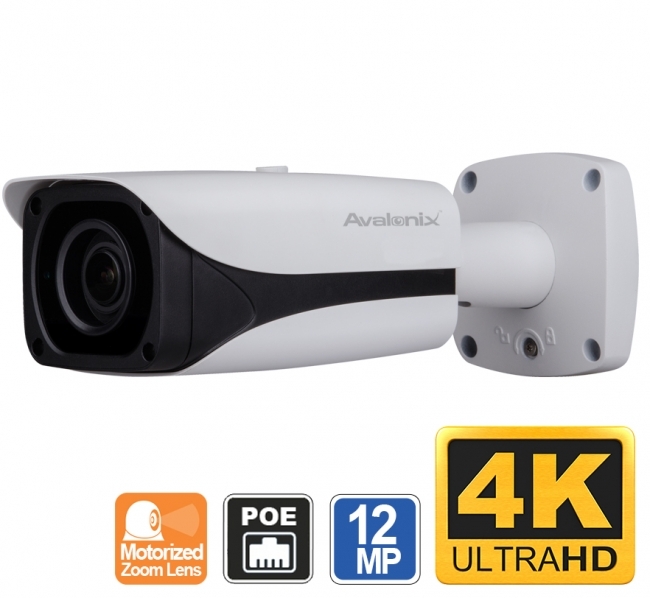 This outdoor 4K security camera also has a 4-16mm motorized optical zoom lens that can be controlled from the camera's web interface, NVR, or from our smartphone app. The massive amount of optical zoom combined with digital zoom makes the camera very useful for long range viewing applications. Although you can use this camera to see license plates from stationary vehicles during the day, it is not a supplement for a license plate capture camera. The camera also has 160ft of night vision. This is an outdoor security camera and is weather proof rated at IP67 standards, which means it can withstand the elements very well without needing an overhang. It is a bullet shaped camera that comes with a versatile 3-axis mounting bracket that allows the camera to be mounted on a wall, ceiling, or pole and can be pointed in practically any direction. Since this 12MP network camera is IP addressable, meaning it can be accessed from the network using a computer, smart phone, or tablet. It has a microSD slot for on-board video storage to which you can add up to a 128GB microSD card. You can also integrate it in to a IP camera system using our 4K network video recorders, or use a camera software suite of your own that is compatible with ONVIF cameras. Powering the camera is easy. You can use either the built-in PoE switch on our NVRs, a PoE Switch, or a 12V DC power adaptor. I have a security system installed at my location since 2007. It is time to update and install a better and more reliable and modern system. I am looking for top quality outdoor complete color system of 4 to 8 cameras max that I can monitor from anywhere and zoom with clarity. What is your recommendation/suggestion. Thanks. If you are looking for the best possible resolution, then please consider our 4k security cameras combined with our 4K NVRs. is it posible to add a 30x zoom lens? The zoom on this camera is limited to what comes with the camera. Currently there are no 30X zoom 4k cameras available. However we do have a new 4mp PTZ camera available with 30x zoom lens. Hello I have 3 questions. 1.) I am trying to understand the difference / benefit of 12MP 4K Ultra HD (this camera above) and 4k IP (http://www.cctvcameraworld.com/4k-ip-camera-bullet.html) both are 4K camera but the one above 12MP not 8MP like the other one and of course the price is more than double? 2.) I intend on purchasing 12 camera so which NVR is best suited? 12MP cameras are able to record above 4K in fact, i.e. 12MP. At that resolution the 12MP sensor provides facial clarity at 70ft away in daylight at a 80 degree angle of view. 8MP cameras provide up to 50ft of clarity at the 80 degree view. Secondly, the 12MP camera provides 4x optical zoom where as the other does not. 3) For 30 days of recording at 8MP 15fps (bit rate of 8mbps) you would need 30TB of storage space. For 30 days of recording at 12MP 15fps (bit rate of 12mbps) you would need 45TB of storage space. The suggested data rate for 12mp 15fps is 12mbps. This will use about 126.56GB of hard drive space per day (24 hours, continuous). Can it be adjustable with camera angles? And would it be the price would be more friendly in the coming future soon? Because the technology is getting updated all the time as well the technology too,. Therefore, I have requested for the 4K highest end recorder and also wondering if there will be a new type will be coming in future? Thank you for your support and understanding. The video sample of this camera demonstrates the motorized zoom this 12MP camera has to offer. You can adjust viewing angles, which are further stated in the product description. The price of this camera was lowered in the end of June 2017. Price revisions would not take place any time soon. For the best NVR to use with this camera, we recommend using these 4K NVR that we offer. Does this model 4K camera have a mic in it? 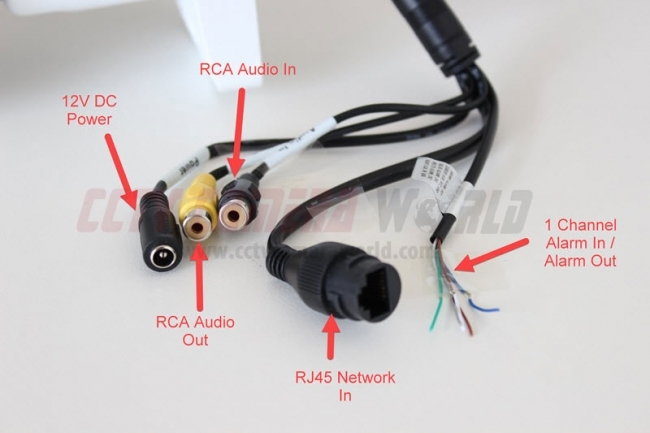 The 12MP IP Camera does not have a built-in microphone, however it has an audio line input and output. You can use a security camera microphone with it. Please see product pictures for the different connections on the pigtial. For a research purpose, we are interested to know if this camera can detect driver's behavior, such as texting while driving. This is a outdoor surveillance camera meant for use at a home or business. It cannot detect motorist behavior. I am in the market for an upgradeable system, starting with two best-resolution cameras (SUHD/4K) of either 8 Mp and/or 12 Mp, but ultimately able to have from 12-to-16 outdoor and a few indoor cameras. My question is whether the recorders can be programmed to constantly write over the prior 30-to-60 seconds of inactivity on each camera, but only record and save long-term when motion is detected in the image (not just leaves blowing mildly in the wind). The recording should include the prior 30-to-60 seconds of inactivity before motion is detected, and for some pre-programmed interval (1-to-5 minutes?) after motion ceases. One camera would be on the opposite side of a rural road facing my entry gate, to capture the rear license plate of someone pulling in. But there is no need for terabytes of storage all night long when few if any cars are driving by. Is this capability possible of recorders saving ony motion-triggered activity, and what is the term to describe this feature? Also, to avoid capturing the motion of hundreds and hundreds of cars simply driving by all day long, can a recorder be programmed to save only the prior minute and a certain period of time after a light-beam parallel to the entry gate is interrupted, or another method (like close-in motion detector) indicates someone or something has left the road and walked/driven into my entrance turnout just outside the gate? Some of our IP cameras offer Smart Detection methods that are more accurate in detecting motion, and thus reducing false positives. Video based motion detection is based on pixel changes, therefore there are many false positives especially in a rural setting. Using select models of our NVR recorders and IP cameras, you can take advantage of a Tripwire feature that our equipment offers. When someone crosses a line, the unit would start recording. You can prepend up to 30 seconds of video before a detected event. For the most accurate motion activated recording, you may want to consider integrating PIR sensors with the system. PIR motion sensors can be connected to either the camera (if the camera has alarm inputs) or the NVR recorder. What brand camera is this? When looking at the picture is has Avalonix written on it but no where in the description does it provide who actually makes it. Made by Avalonix as states the logo on the camera. What recording software does this work with? Is it your proprietary software or can it be used with 3rd party software. This 4K 12MP camera comes with free viewing software, and it is also compatible with 3rd party software like Milestone, Blue Iris, etc. Can this camera take still images? All of our IP cameras allow for recording schedules to be set for either video or snapshots (still images). You can save snapshots at the same resolution as the video or at D1 resolution, and target the snapshots to save to a FTP server or internal SD card. You can set a time interval of 1 to 50000s for the snapshots. 1. Camera Horizontal field of view 20º-40º so will the camera be able to handle the width of 3 lanes each lane is 3.5 Meter? 3. In the night will the license plate reflect blinded by light? This is camera is not suitable for LP capture. You can find license plate capture cameras here. I want a camera that can zoom-in and in playback mode, if the camera is already zoomed out, can it still be digitally zoomed in with clarity. High resolution cameras such as this 12MP camera allow the user to zoom in on video to the extent the camera's resolution provides. If you watch the video sample on the product description page, you will see a video sample that provides a demonstration of the video zoom capability of the camera in the digital zoom window. The Lorex NVR you referenced supports a max of 8MP or 4K IP cameras. It is comparable to our NVR416P4K. You would have to down-sample the 12MP camera to 8MP by using its built in web interface to work with your NVR, and will lose out on the extra clarity. Instead, you can use our H.265 16 channel NVR that supports up to 12MP and works with Lorex cameras.